This post is written in partnership with Sprouts. All opinions are my own. It’s that time of year again. The time where I get swoon-y about fall and start quoting my favorite lines from You’ve Got Mail. Don’t you love New York in the fall? It makes me want to buy school supplies. I’d send you a bouquet of newly sharpened pencils, if only I knew your name and address. Something about the fall is magical to me. The arrival of sweater weather, the advent of the holidays, the crispness of the air, the bountiful produce, and soup season. Of course, where I live, it’s mostly honorary and ceremonial connection to all but the arrival of the holidays, but that doesn’t mean I’m not true to my favorite season. Which is why I’m eating this soup. Now. In 106 degree weather. And loving it. It couldn’t be easier. The ingredient list is short, it’s a great use for those few carrots and stalks of celery you sometimes find yourself with after buying a bag to make something else. After soaking your beans, it’s basically a “chop and drop” recipe, where you just toss everything in the slow cooker, then set and forget it for a few hours. No extra fuss or attention needed! It’s mega affordable. This is a SUPER budget-friendly recipe. It’s made from pantry staples, and makes use of dried beans which are a great way to extend your grocery budget. I find my dried beans at Sprouts–you can find them bagged or in the bulk bins, so you can buy just the amount you need or stock up when they’re on sale. Sprouts is my go-to grocery store for a lot of reasons (an awesome selection of gluten free/dairy free items, fantastic quality of and prices for produce, and their amazing sales, among other things). 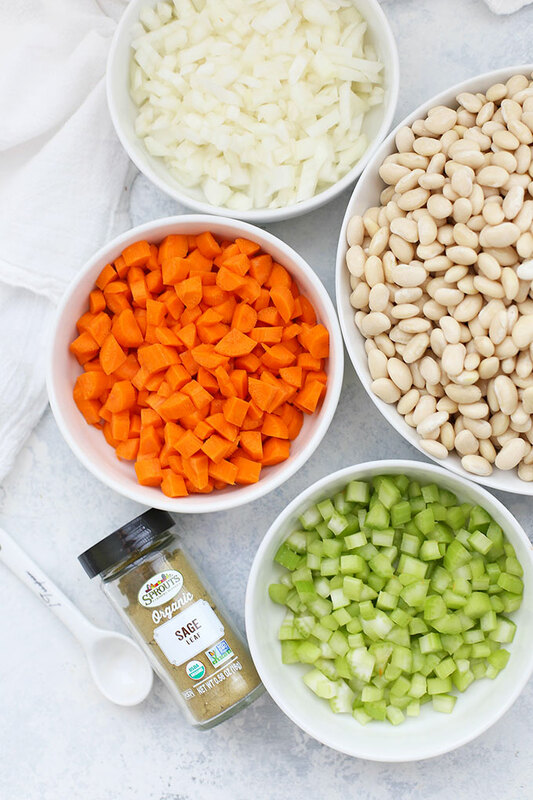 Stocking up on staples like quality vegetable broth, organic spices, and pantry items like dried beans means I’m always ready to pull together an easy, healthy meal without breaking the bank. It’s a simple classic. This is the most basic version, but don’t be fooled by the short list of ingredients. You may be tempted to add all sorts of herbs and spices, or to throw in extra vegetables or meats. I highly recommend trying this recipe exactly as written the first time. Taste how delicious it is, and then let your imagination run wild, if you must. It’s easy to dress up. That said, it’s always fun to play with a recipe, isn’t it? For vegan friends, you can add in some extra veggies (like bell peppers, or leeks), play with the spices (a little rosemary or thyme along with the sage is amazing). 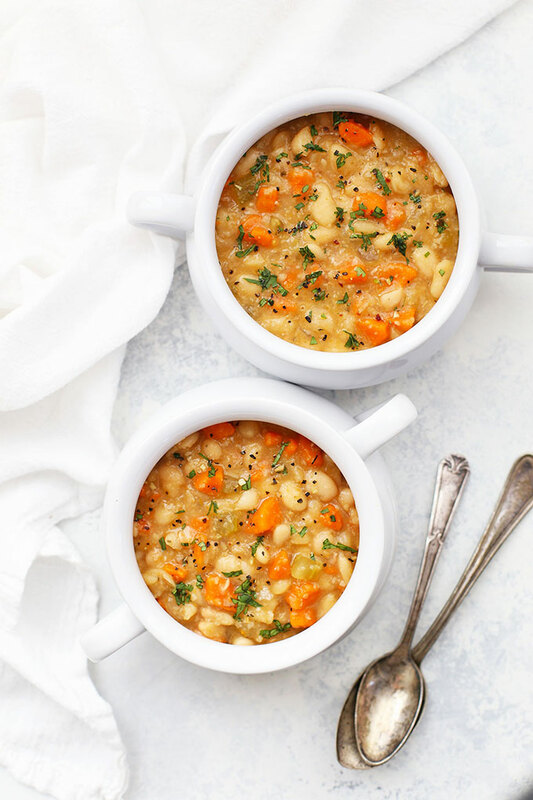 For non-vegan friends, try adding a little ham hock or a few slices of crisped bacon into the soup before your cook it (better yet, top it with a few slices of crisp bacon before serving). I just think it’s amazing that something so simple can fill you up deep down in your happy place. And my happy place includes fall, and You’ve Got Mail, and soup. Let’s Talk Slow Cookers – If you’re on the hunt for an awesome slow cooker, we really like ours. It’s programmable and has a clip for the lid. Lid clip = NO SPILLS! I use it ALL the time and can’t recommend it enough. How to Soak Beans (& Why) – Soaking beans beforehand makes them easier to digest, and shortens their cook time. I highly recommend taking the time to do this the night before for the best texture and fastest cook times. To soak properly, first pick through your beans to make sure there aren’t any bad ones or stray pieces of rock or sand that can sometimes make their way into dried beans. Then, rinse them in a colander for a minute or two. Transfer to a large bowl and cover with water. (The water should reach 2-3 inches above the level of the beans.) Refrigerate in the bowl for 4-12 hours or so (I leave mine overnight). Then, drain and rinse them, and they’re ready to use! Forgot to Soak Your Beans? If you forgot to soak your beans, you’ve got 2 choices: 1) just rinse them in a colander and plan on them taking about 7-8 hours to fully cook in the slow cooker. 2) Take a shortcut. For the shortcut method, put the beans in a large soup pot and cover with 2 inches of water (2 inches above the level of the beans). Bring to a boil, and boil for 2-3 minutes. Turn off the heat, cover the pot and let them soak for about an hour. Drain and rinse them in a colander, then proceed with the rest of the recipe. To Salt or Not to Salt – There are a LOT of opinions (even among experts!) about whether you should or shouldn’t salt your beans during the soaking and cooking process. Many folks say to add 1 Tbsp of salt per pound of beans to your soaking water. Other folks say do NOT add salt at all until the beans are completely cooked. I haven’t found that this matters much for slow cooking (since they’ll have plenty of cook time either way), but I do recommend waiting to salt the soup until the end, since sometimes your broth will condense a bit during cooking. Soak beans in water at least 4-12 hours, or overnight (see notes for a detailed explanation of how to do this.) Drain and rinse beans in a colander. 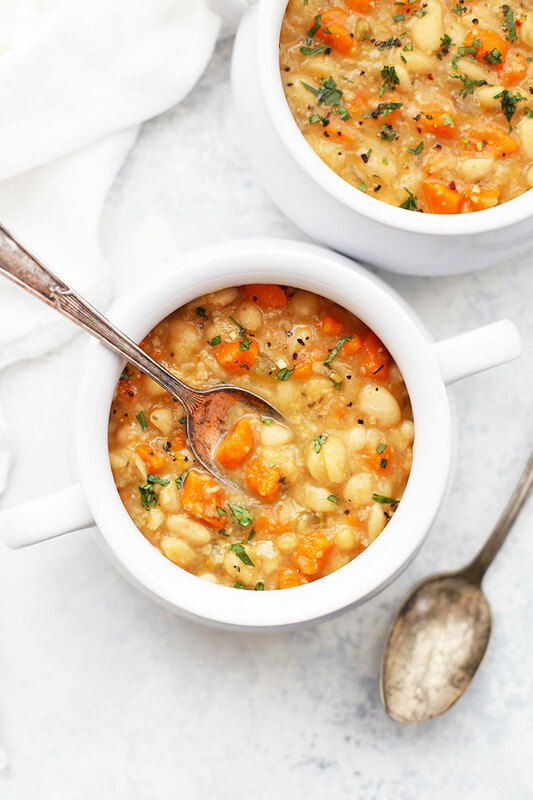 Place soaked beans, carrots, celery, onion, garlic, and sage in the slow cooker. Cover with lid and cook on HIGH for about 6-8 hours (the beans will be tender after 3-4 hours if you’ve soaked them beforehand, but the longer it cooks, the creamier the soup gets). 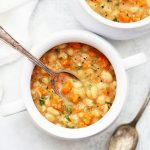 Dress it up (variations) – For vegan friends, you can add in some extra veggies (like bell peppers, or leeks), play with the herbs (a little rosemary or thyme along with the sage is amazing). 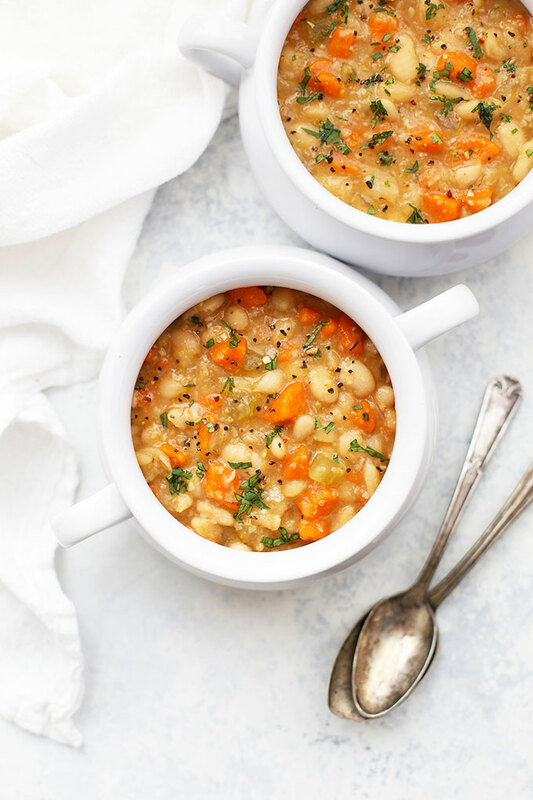 For non-vegan friends, try adding a little ham hock or a few slices of crisped bacon into the soup before your cook it (better yet, top it with a few slices of crisp bacon or kielbasa before serving). I top with crumbled bacon because…bacon. Love this easy recipe. Oooh, I love this one with bacon. So good. 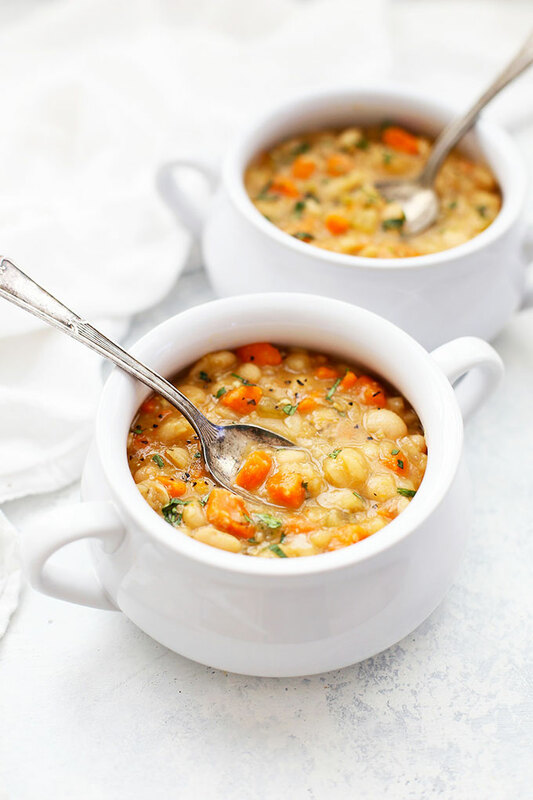 This was great, especially for a vegetarian dealing with acid reflux — no tomato in this recipe. Very tasty! I added spinach and cilantro. Lorrie D. – That sounds delicious! I’ll have to try that next time! Do you have a favorite brand of vegetable broth? I haven’t bought any lately, but in the past, my experiences with vegetable broth were disappointing. You might find this taste test helpful! I also like Sprouts vegetable broth base. It’s liquid and comes in pouches you combine with water. The ingredient list is pretty straightforward and the taste is great for a shortcut! Thanks! I’ll read that, and the articles they link to as well. I made this today and really enjoyed it. Easy and very tasty for such a simple recipe. Will definitely make again, possibly with the other spices you mentioned, or spinach as mentioned in another comment. Surely is good on its own, though. Thanks! Yay! I’m SO glad you enjoyed it Emilie! this is delicious! i made it exactly as written, and then put a few cupfuls into my bullet for extra creaminess. Ooh–great tip! So glad you enjoyed it! Thanks so much for sharing Instant Pot directions! I’m sure lots of folks will appreciate that! Can you share the nutritional information? Can I use canned beans instead of dry? I’m in a pinch and don’t have dry. Thanks! Lauren – You probably could, but you’d have to play with the amounts of liquid, and I don’t really know where to advise you to start. The dry beans absorb a LOT of the liquid. Maybe you could add all the other ingredients, then pour liquid enough to cover it by and inch or two and start from there. It’d probably only take half the time with canned beans, as well. You’d just need to cook till the veggies were tender. I hope that helps! I doubled the recipe and am afraid I may have added too much onion! Yikes! It’s got 5 hours to go! We’ll see! Hope it turns out. The recipe looks amazing! My fingers are crossed for you!!! How did it turn out? Could you make this with black eyed Peas? Looking for a vegan bean soup. Can I make this on the stove or does it have to be in a slow cooker? Made this for our New Years Dinner today, was very good. I added some smoked paprika for flavoring. My Great Northern Beans did not get as soft as I like despite soaking overnight and cooking in crock pot on low for 9 hours. They were cooked, not crunchy but not soft. Any suggestions would be appreciated. I bet the smoked paprika was delicious! I’m sorry to hear your beans didn’t soften! A few things can impact the beans, but the most likely culprit is old beans. Old dried beans have a harder time soaking and softening. (This article breaks down why). It can be hard to tell exactly how old your dried beans are, because some stores don’t have very quick turnover, but overly old dried beans start to lose some of their porousness, and can struggle to soften. One suggestion I’ve seen several times (but haven’t yet tried myself) is to add a bit of baking soda to the water. This might be helpful next time? This article walks you through how to do that. I hope that helps!! Thanks for your reply Emily. The smoked paprika did add a bit of that smoked taste that some might miss if used to making it with ham. I only put in 1/4 tsp just to try, it seemed enough for me. I had read about the stale beans, checked the bag of packaged organic Great Northern Beans, it did say expiration date June 2019 although that might not be a sure indication they were not stale. I will try beans from a different source next time. I also read about the baking soda too and will try that next time. Also read about boiling the beans some in addition to soaking. I will try various methods and see what works best to get them as soft as I prefer. It still was delicious, love the low calories and high fiber content. Thank you so much for circling back! I am so excited to hear what you learn! This just did not work for me. I used a bag of dried beans that don’t expire for a year, and soaked them for over 12 hours overnight. I added them to the slow cooker and after 7 hours, they STILL were not cooked! I got frustrated (and was starving!) so I added the uncooked soup to my instant pot instead, and did it THREE TIMES on high pressure – once for 3 minutes, once for 5 minutes, and finally for 9 minutes because I was so frustrated. The beans were still a tad undercooked but I ended up using my immersion blender to make it more creamy. Aside from that, the flavors were okay – I topped my bowl with sound freshly ground herbs de provence for extra flavor. May try making this again with different beans and some additional spices, such as smoked paprika and maybe some nutmeg, which my mother tells me is GREAT for navy beans. Christina – Oh dear! It sounds like it was a problem with the beans. If your pressure cooker couldn’t even soften them and you’d soaked them 12 hours, I can almost guarantee it was the beans. Dried beans aren’t *super* tightly regulated, so even if your package says they have a year before expiration, they may have been dried and packed several years ago. I need to print it out but how do you print it without the ads? Don’t know if this will work for you, but I hit the print button and discovered it takes a second for the ads to appear on the print page. So I closed the print page, opened again, and immediately hit print before the ads appeared, and it worked – no ads on my printed copy. Not sure if it will work ever again, but worth a try! Thanks for that suggestion– I’m trying to work with my developer and ad companies to resolve this issue! You could also copy and paste the recipe into a Word document as a workaround in the meantime. Can I use fresh sage instead of the dried sage seasoning? If so, about how much? Looking for a healthy and easy recipe on a cold day? This is it! We used a healthy dried bean mix from Natural Grocers and added extra veggies from our freezer. I played with the spices using sage, freshly crushed rosemary, smoked salt, sea salt, freshly ground pepper, and a bit of tomato paste. Topped it off with a few pieces of vegan cheese, and a slice of garlic bread. A complete meal! YUM! That sounds absolutely delicious. Thank you for sharing!!! If adding potatoes, how and when would you add them? 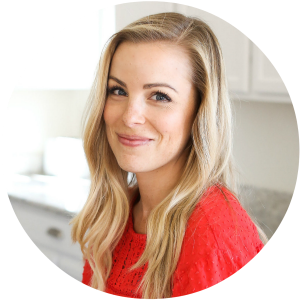 Alicia – I haven’t added potatoes to this recipe before, so I’m not sure how to advise you. I’m sorry! Omg! I made this and is sooo good. I added 1/3 cup of whole wheat quinoa and a bit more of vegetable broth with a splash of lemon juice. Just what my preggo body needs. Thank you for the recipe. If buying beans already packaged from local grocer how can you make sure they you have beans that will soften if you soak them? It can be tough to tell (and I’ve bought some bad bags myself–SO FRUSTRATING! ), but the best suggestion I’ve heard is to buy from a store with regular turnover. Health minded stores, co-ops, and farmer’s markets sometimes tend to have faster turnover for dried beans. (That said, I’ve had good luck buying beans at Target and Kroger without a problem other times). Thrive Market is another great resource (online). I just put this all together. Still in crockpot since 9:00 eastern time . soaked beans. Used sage and paprika. It is still missing something. I also added half stick butter for more flavor. I am taking to feed teacher for lunch at local school tomorrow. Any suggestions? Great recipe! I didn’t have time to soak beans so used dry lentils instead since they cook faster. Also I used homemade vegetable broth that I make a big batch of once a year and freeze, if anyone is interested in the broth recipe I can add it! Oh man, I’d LOVE that broth recipe! Thank you for sharing!